I have written a fair bit about minimal shoes over the years here, here and here on this blog. I have done a little running in the VFF but that totaled less than 50km and only about 5km at a time. My thinking has always been that you can get most of the benefits with very little risk of injury by wearing minimal shoes every day rather than expose yourself to the pounding of running and run the risk of injury. 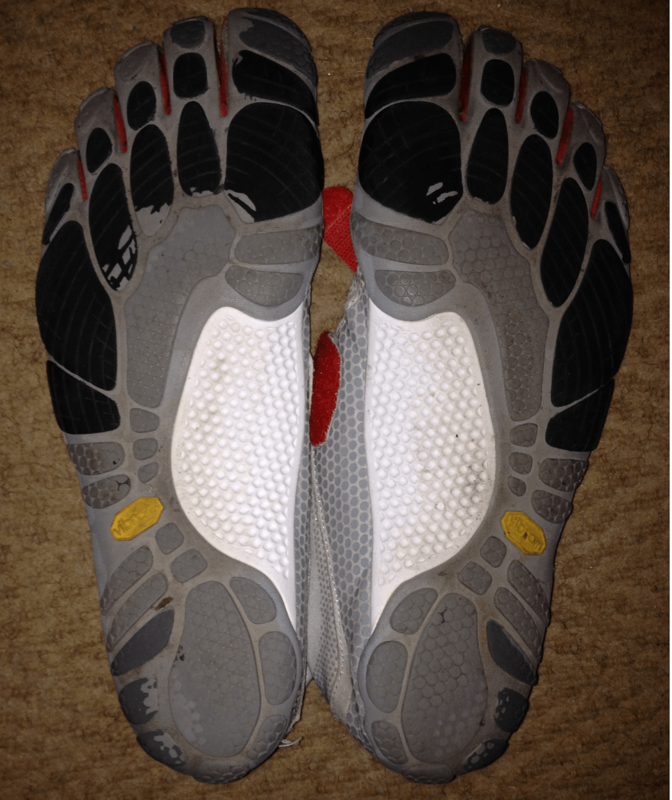 The minimal shoes that I have worn the longest and in some way are my favorites are the Bikila from Vibram Five Finger below. Well I noticed something rather interesting over the months. Let’s look at the bottom of the shoes at the wear. First of all I am amazed how little wear there is after two years of wear most days to work. Have a look at the image on left closely. For some reason I can not place these images next to each other. Please excuse the unnecessary scrolling. My right foot (image left) has got a lot more wear in the ball of the foot. Not sure if you can see but there is hardly any wear on the big toe. 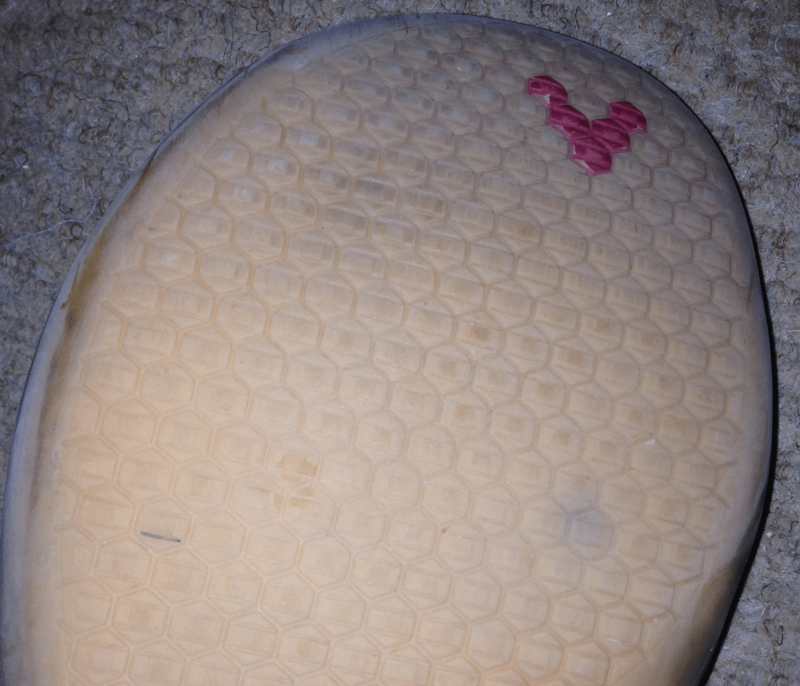 I tend not to roll through very well on this foot and it shows on my running shoes too. 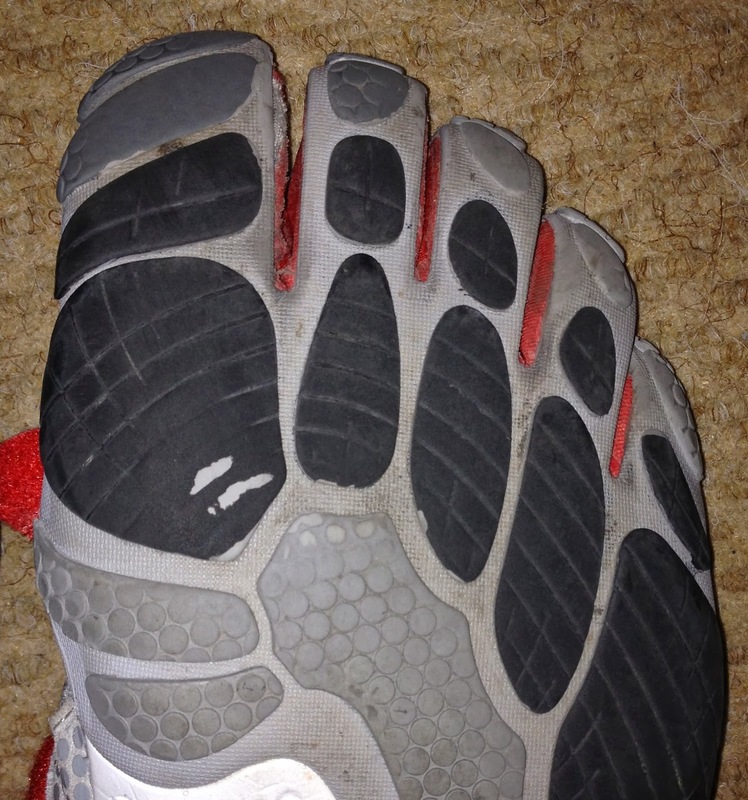 My left foot has a good bit of wear in the big toe. Otherwise nothing else weird here. First of all I was surprised by how much wear there was on the heels but then I was standing a fair amount and not actually running as per natural barefoot runners. Right heel show way more wear than the left. I got these so that I would have a more “normal” looking pair of shoes. They worked pretty well. 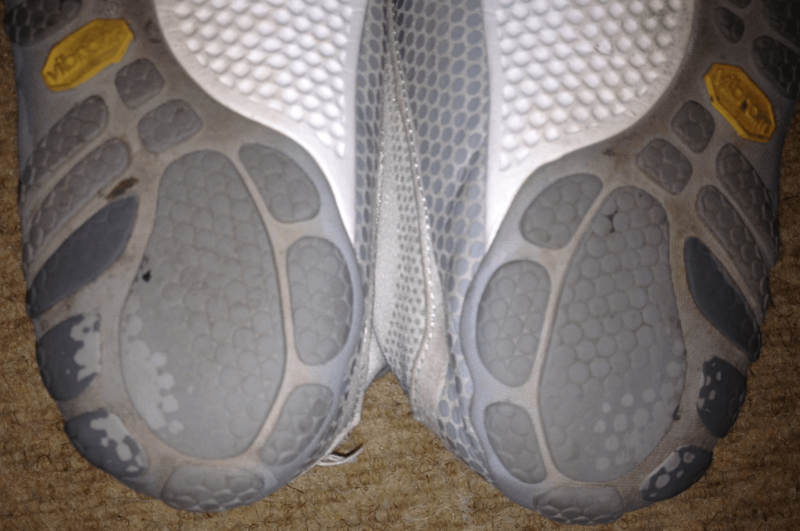 One issue I have with them is that the transition from midfoot to toe area somehow goes through a dead spot which is really annoying. As you can see the sole is flat as a Karoo landscape and the forefoot is super wide. I really love these and they are a close favorite, especially when worn with injinji socks. Maybe I can get some people who know more about wear in shoes to comment. Right now I just wanted to document my experiment of one here. I like all of the above shoes for what they do and the “close to the ground” feel I get. But then I like a bit more protection underfoot when pounding down a rocky trail. Let’s have your comments and experiences below! VIVOBAREFOOT for me is the original and the pace setter. 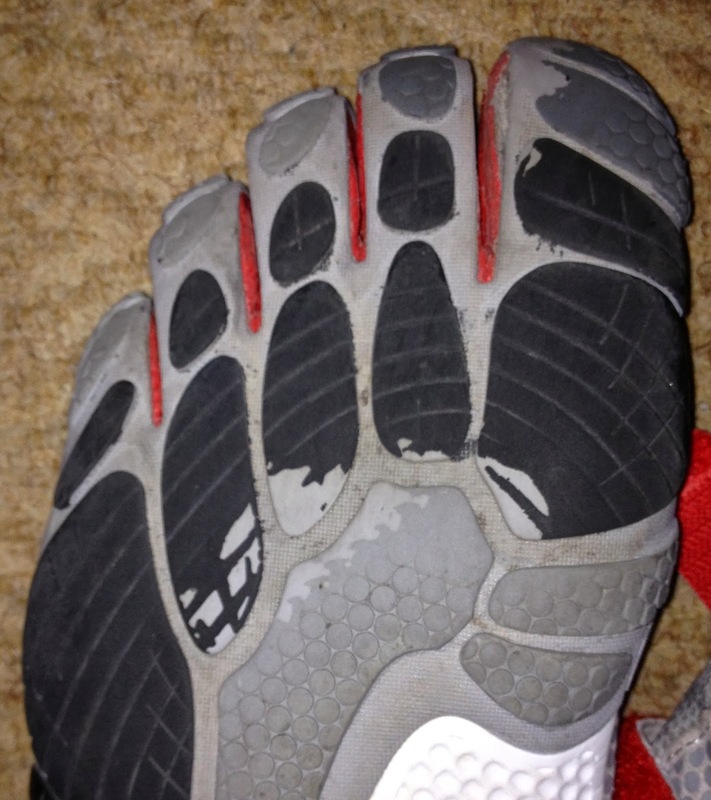 Their trail shoe has the trade off off grip versus flat to the ground but it is barefoot and high performance. 5 out of the 12 SA trail team in long and U Lyra wear them. When it comes to lifestyle all their range rock. It is not just about running it is about lifestyle after all ….how many hours do you run and how many hours a day do you wear shoes. I've run a fair bit in “Minimal” shoes, my old KSO's have over 1600km logged, now ready for the bin… But while the top didn't like fynbos I did fine running over the mountain. The 'shammy' inner has worn out and on the heal I'm standing on rubber. But I could run on in them if I had too. I now have a new pair of Trek's and they already have 670km logged, including a 2h54 marathon and a 79min half. This pair is a lot stronger and I would say have more 'sole'(thicker) then my New Balance MT10 after 600km can't remember what the MT10 felt like new. I also have the NB MT00 and while a trail shoe I have run most of the 1500km on the road! Now while I will run on the trails with those shoes, I wouldn't race with them… for racing I need a little more, so I use the NB 1010. The old 1010 was amazing, but just not tough like me (ha ha). But the new V2 1010… That is great and my race shoe for now. Minimus but a little more shoe. I bought a pair of Vivo's to try out. The lugs on the “trail shoe” came off after like 2 runs. I ended up throwing them in the bin and put it down to one of my poorer decisions for the year. 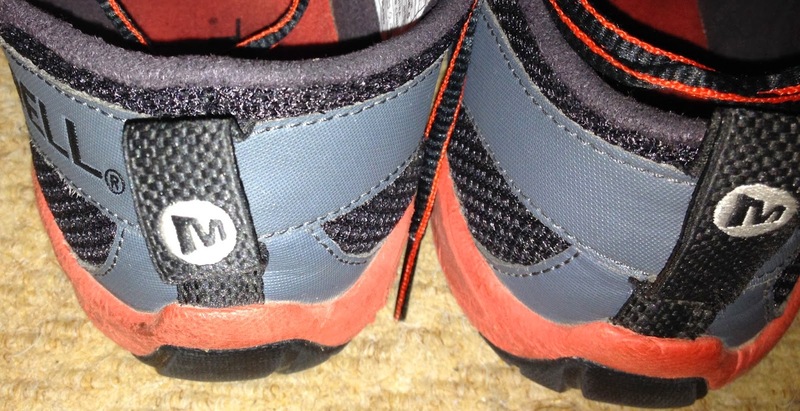 No mention of some of the Inov-8 lower drop shoes? I see a lot of Inov-8's at trail races. Perfectly happy with my minimalist lifestyle offerings from Inov-8, NB, and Vibram.